I've seen the ECB Penguin used to demonstrate why ECB is not a recommended method of encryption, but I do not understand how this translates to text or passwords. Aren't the people who create these images comparing apples and oranges? Now, what does this mean in the real world? If I gave you an email encrypted with AES-128 ECB, could you look at it and figure out the plaintext? Most likely not. If, however, I gave you a ciphertext from a long book and told you it is the encryption of one of 100 books, could you figure out which book it is? Probably. So, comparing apples and oranges? In some ways yes, in others no. I think though that the point people who show this are driving home is that there are stronger modes which are much more likely to lead to a secure system. Sure ECB could be used to develop a system which is secure, but it would take a lot of analysis to convince an expert of that. Passwords with the same 8-character prefix yielded ciphertexts with the same first block, making it easier to guess the prefix by comparing hints. 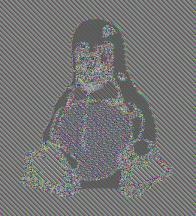 Similarly, any multi-block passwords differing only in some of the blocks would yield partly matching ciphertexts, and any password that happened to contain repeating 8-character blocks (say, "passwordpassword" or "aaaaaaaaaaaaaaaa") would produce a repetitive ciphertext, just like in the Tux image example. Which ECB ciphertext stealing scheme is this?